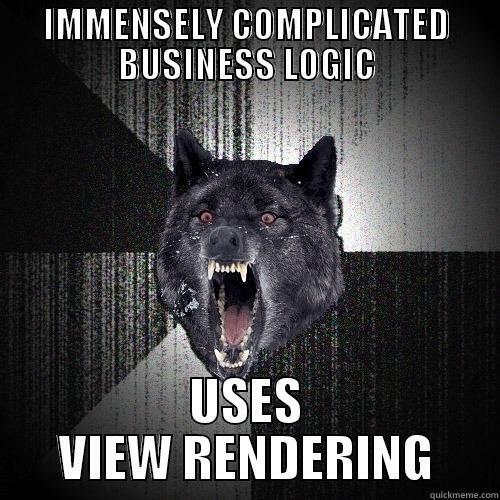 What is a view rendering? A view rendering consists of a view that takes a RenderingModel by default. The model is assembled by the Sitecore MVC pipeline, and you can create your own, custom models. Because the pipeline expects an Initialize() method on your model, you can either inherit from RenderingModel or implement IRenderingModel. To post a view rendering, specify the controller and action that you want to post to on the component’s definition item. They are simple to use – especially if you do not use a custom model. Most of the time, you only want to display some content from the context or data source item without requiring any business logic – a simple ‘page’ will often consist of a title and some text, which you can do very easily with Sitecore’s RenderingModel and the @Html.Sitecore() helper. There isn’t much to unit test here (you can certainly do web tests), and creating a controller action seems extraneous. When you post a form from a view rendering, it will only post the action you have specified – after which you can redirect to another page or trigger the Sitecore rendering pipeline. This is not the case with controller renderings, which make posting forms a bit more difficult. If you need to do any business logic when retrieving your model, you will want to do that in a separate layer. However, because you do not have access to a controller, the only place you can do this logic is in the Initialize() method of a custom model – and putting business logic in the model itself is not ideal. It’s just not very ASP.NET MVC. Developers are used to having a controller and an action, and view renderings do not work like that. However, you must keep in mind that Sitecore MVC is an implementation of ASP.NET MVC that needs to suppor the same features as its Web Forms counterpart. The modular nature of a Sitecore page introduces challenges. Personally, I would use a view rendering if all I was doing was outputting some data from the context item or data source item – or even if I was outputting a list of an item’s children, as long as there is no business logic (access rights, for example) involved. If I was doing something that required any business logic at all (outputting the reduced special offer price of a hilariously kitsch pair of fuzzy dice, for example), I would use a controller rendering. What is a controller rendering? Rather than specifying a view, the component definition item for a controller rendering specifies a controller name and an action name. When the rendering is added to a placeholder, this action is executed and the view is returned. They look ASP.NET MVC. You can use dependency injection and common patterns (like the repository pattern) as you normally would, and create your own actions. Keeps your business logic separate from your model; you can create plain POCO classes that are hydrated by a business logic layer. Although they look ASP.NET MVC, they are still renderings and will not behave exactly as a controller action might in a standard ASP.NET MVC application. This is particularly evident when you try to have more than one post on the page, or attempt to RedirectToAction. They are executed after the main view has already been rendered, which results in some unexpected behaviour – again, this might cause some strange behaviour when you try to post a form, and with TempData (if you use that). Personally, I use controller renderings whenever I have to do any business logic – I inject a domain / business logic layer and use it to construct a view model specific to that rendering, which is often a mixture of rendering parameters and content. If I am posting a form, I will use AJAX as much as possible to avoid having to deal with some of the form posting peculiarities. I have not come across any evidence that would suggest that controller renderings perform worse than view renderings. Having favoured controller renderings for everything to begin with because they feel more ASP.NET MVC, I now use view renderings whenever my only job is purely to output content – and since Sitecore is a CMS, this happens quite a lot. If there is so much as a line of business logic code needed – controller rendering. My rule is to follow general ASP.NET MVC practices as much as possible: dumb models, no business logic where it does not belong, separation of concerns, etc. If I can follow those rules with the rendering I pick, it’s probably fine.